This vintage 100% polyester short robe was originally sold at Robinson's Dept. Store and was styled in California. It's in a dark aqua blue with a tone-on-tone flower and leaf pattern. There are 2 inner ties and a 70" long by 2" wide fabric tie belt. 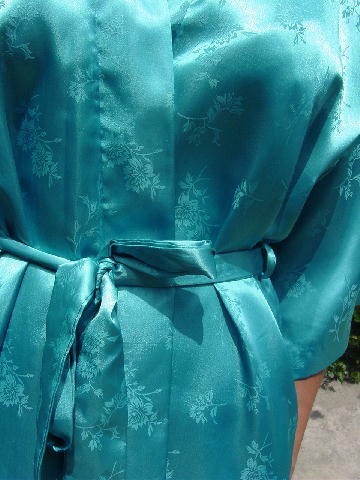 There are 3/4 length kimono type sleeves. shoulder to end of sleeve 11 3/4"
armpit to armpit 24 1/4"